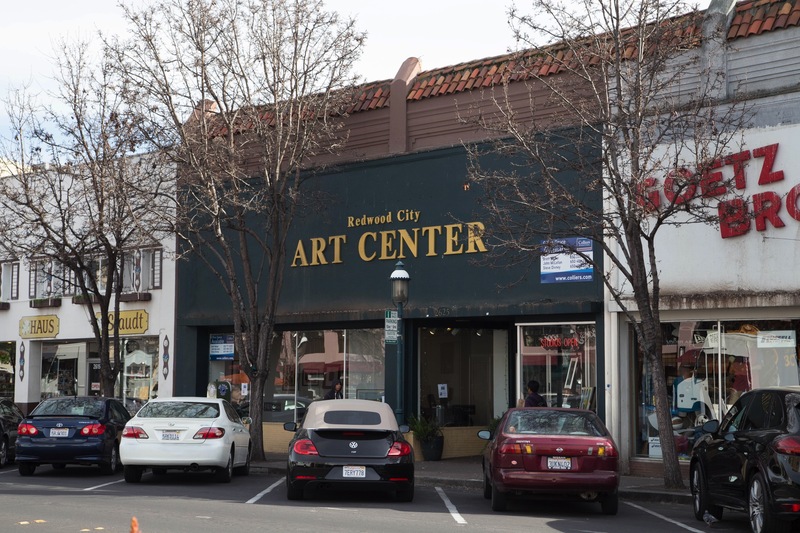 Redwood City Art Center, at 2621 Broadway. This space not only boasted art for sale, it contained a number of studios where artists could work and where art classes were held. Fortunately the Redwood City Art Center still exists, albeit now in San Carlos. Goetz Bros. Sporting Goods, at 2629 Broadway. Goetz Bros. was a long-standing Redwood City institution that catered to sports teams and individuals alike. They, too, are still in business, thankfully—again, operating from a new location in San Carlos. TechWorld Trading, Inc. (and, before that, Mariel’s Bridal Boutique), at 2635 Broadway. TechWorld sold and repaired high-tech electronic devices such as cell phones (repairing cracked screens appears to be a specialty). They left Redwood City for new digs in Menlo Park. The Art Center was the first to close, and the first space to be redeveloped. Because the typical per-square-foot rent for office space is higher than that for retail, the bulk of the former Art Center was converted to offices. However, because this section of Broadway is required by the city to be fronted by “active uses” (retail, restaurants, or services), the developer left a tiny (591 square foot) retail space along the Broadway frontage alongside a door providing entry to the much larger (9,142 square foot) two-level office space behind. 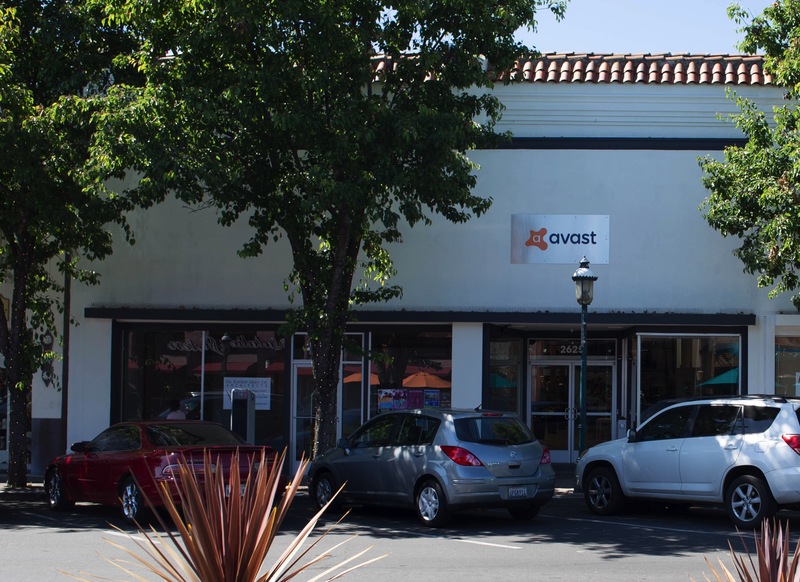 That office space was quickly leased by AVAST Software, Inc., a developer of security software that is headquartered in Prague, Czech Republic, with additional offices in the USA, Germany, China, South Korea and Taiwan. Because the retail space in front and the office space in back are intended to be leased separately, they were given separate addresses: the retail space is located at 2621 Broadway, while the office space entrance is labeled “2625 Broadway.” Perhaps because of its size, the retail space has remained empty since the building was refurbished. 591 square feet is pretty small and thus only a very limited number of businesses can reasonably fit within. Immediately next door, to the right, was where Goetz Bros. Sporting Goods was located. Ever since Goetz Bros. moved to San Carlos, contractors have been busy refurbishing their old space following the model of their next door neighbor: they are taking what for Goetz Bros. was a single 8,882 square foot retail space and turning it into a 1,042 square foot retail space along the street and a 6,075 square foot, two-level office space behind. The office space will be accessible from Broadway, through a new door just to the right of the retail space. As you can see from the above picture, Goetz Bros. used to have a large inset leading to their front entrance. The new design will have two separate entrances—one for the retail space, and one for the office space—that will both be housed in a single inset that will extend to the right edge of the building. Within the inset the main focus will be on a pair of double doors that will lead to the retail space. To the right of those doors, though, there will be a single door that will lead directly into a hallway that will extend past the retail space and into the office space behind. As is the case next door, the retail space will be somewhat small—although at just over 1,000 square feet it will be almost twice as large as its next-door neighbor’s retail space. And unlike its neighbor this retail space will be deeper than it is wide: it will be about 25 feet wide and 42 feet deep. From a look at the plans it appears that there will be an attic above the space that could possibly be used for merchandise storage (that attic space seems to be accessible by both the retail and the office space, though, so the use of that storage area may need to be negotiated). 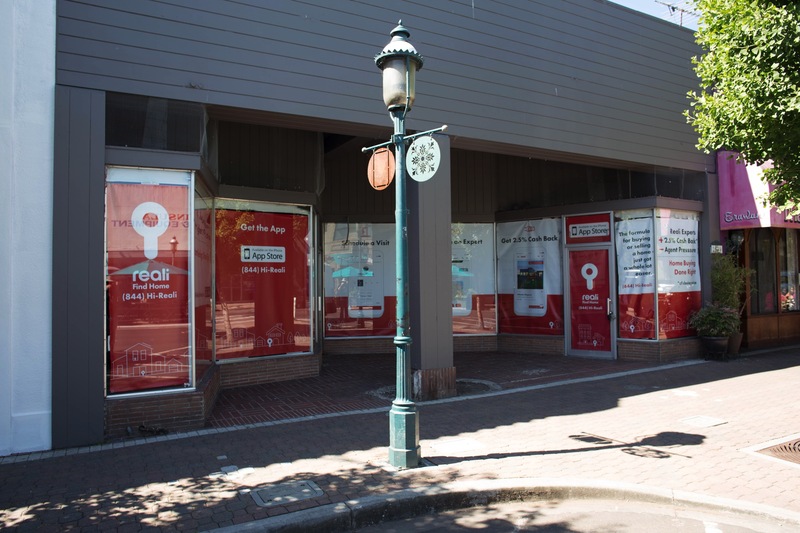 So this retail space appears to be usable by a somewhat wider range of businesses, and thus hopefully it will find a tenant much more quickly than the space in front of AVAST has done. In this new configuration, the office space being carved out from the old Goetz Bros. storefront is being lofted to maximize square footage. Even with that, however, this new office space will be a lot smaller than its next-door neighbor. Its 6,075 square feet will be divided into 3,464 square feet on the ground floor level and 2,610 on the upstairs “mezzanine” level (AVAST’s office space is similarly configured, with a second-floor “mezzanine” space in the back). Work has been underway on the old Goetz Bros. space for some time now. When they are done, I’ve heard that AVAST may be occupying this office space as well—so the bulk of the space likely won’t remain empty for long. 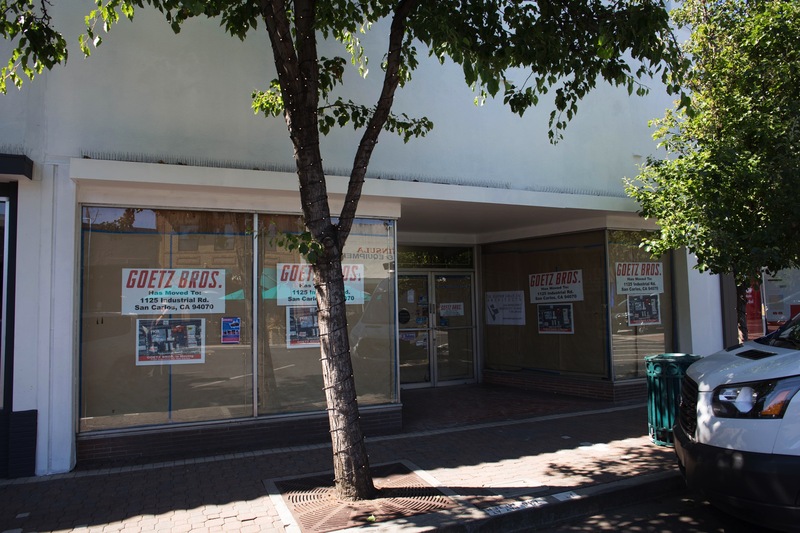 Here’s hoping the building’s owner can find a tenant for that retail storefront, though: mandating storefronts along Broadway is all well and good, but if those storefronts sit empty, well, that certainly isn’t what the City Council had in mind. Personally, I’d rather look at an empty storefront. Regardless, a developer has plans to turn this space, too, into offices, with retail in front. Those plans were approved by the Redwood City Zoning Administrator back in February, although no building permits appear to have been issued as yet. This particular space is somewhat smaller than its two neighbors. For one thing, the building is already divided into two parts, with Erawan Thai Restaurant taking up part of the building’s square footage. The remainder, which sits beside and partly behind Erawan Thai, would be augmented by mostly filling in the inset entry, giving the developer an additional 178 square feet to work with. Then, the office would be split between the ground level and a mezzanine. Currently the space is 4,099 square feet in size, with an existing 800-square-foot mezzanine. That mezzanine, however, only appears to have about six feet of headroom (the space below it has about seven feet of headroom). In the new design the mezzanine would retain its existing footprint, but would be extended above the current roofline to allow it to attain full height. Because the mezzanine is located towards the back of the space—about 30 feet from the Broadway facade—the changes should only be visible—if they are at all visible—from the rear, on Winklebeck Street. In this building’s proposed redesign the mezzanine has a second purpose. It would contain a door that allows the building’s employees to access another unique feature: an 1,148 square foot rooftop deck. Like the mezzanine the deck would be located towards the back of the building, on the Winklebeck Street side. Thus, the deck and its occupants should not be visible from Broadway. When looking at the front of the redesigned TechWorld space, the door to the office space will be to the left—adjacent to the entrance to the office area being constructed in the old Goetz Bros. space. This door, too, will open onto a hallway that will lead straight back past the retail area, here to the building’s 4,271 square feet of office space. Although the building currently has a door that exits out the back, according to the preliminary plans filed with the city that door would be sealed and instead a second hallway, this one at the far right, would lead to an emergency exit door in the building’s front face. As for the retail space, its double entry doors would be located near the middle of the building’s face, between the office door on the left and the emergency exit door on the right. Size-wise the retail space would be in the middle of its two neighbors, at 806 square feet. Before these three spaces (Art Center, Goetz Bros., and TechWorld) were remodeled, they in total provided some 22,700 square feet of retail space. Assuming the TechWorld space is remodeled as planned, when complete we should be left with a total of 2,400 square feet of retail fronting three office spaces totaling just under 19,500 square feet. Those retail spaces will be fairly small, at 591, 1,042, and 806 square feet. So now the trick is to find uses for those spaces that qualify as “active”: retail, restaurants, personal and business services (including hair and nail salons), and some entertainment uses. Given the size of these spaces, most restaurants are out—although I could see someone squeezing in something along the lines of a frozen yogurt shop (especially given that they would presumably be able to put a small table or two out on the sidewalk). All but the largest of the spaces seem too small for a hair or nail salon, but some specialty retail might work. One of my friends suggested a tasting room for a local winery, an idea that has merit. Or, perhaps a store that sells cellphone cases (as if we need another one of those). Do any of you have other ideas? I’d love to hear them: add your suggestions in a comment to this post! The world of retail is rapidly changing, largely due to the rise of commerce on the internet. But there will always be a need for certain storefront businesses, including food service businesses, personal services (nail and hair salons), and retailers of products you need right away (hardware stores, gardening centers, etc.). Finding ones that can fit into small spaces such as we are being left with on Broadway will be tricky, but, for the right price, should be doable. Here’s hoping that the building owners are making a real effort to fill those spaces, and don’t just leave us looking at empty storefronts (or, perhaps worse, window-sized advertisements). Really? That’s fantastic! Thanks for the update. The last I new of, RWC gets a head tax per employee. Being that the City has to pay for Social Services, they always need more of your money. I’ve lived in RWC my whole life and RWC seams to have always made the wrong choices for downtown. I’ve herd complaints from merchants that people come for the free stuff and leave without shopping (what little there is). I’ve also noticed that downtown is starting to look and smell like downtown SF. Complete with Bums and Panhandlers. However “Business is Business” and the Landlord has the right to charge what ever the market will bear. Untill some SJW convinces the City to install rent control and them its “Buel-la the buzzer” time for the already caught in the maelstrom downtown. P.S. A trendy mechanical watch sales and grand father clock repair, might fit in a small location ? Thanks for the info … I was sitting outside Pho Dong the other day and noticed the stores were closed … I had no idea the conversions were under way and that the demand for office space was trumping retail on Broadway. Why is our city allowing the 2600 block of Broadway (let alone any part of our downtown) to succumb like this? Such large-scale office space takeovers of prime walkable downtown active retail spaces is an urban planning failure and substantially erodes the retail environment and street vitality for everyone, including remaining businesses. If all a developer has to do is leave a barely-functional token sliver of retail on the street frontage in order to convert the bulk of any downtown building into dead-to-the-public office space, then our city leaders and staff planners are to blame and need to take corrective action pronto. It’s sad that they don’t make hardware stores or ice Cream parlors. It’s all about office space. It’s a double edged sword though. Would a hardware store or ice cream parlor get enough business to sustain themselves? We complain about having to pay for parking downtown so people shop/eat elsewhere. In popular downtowns such as ours, where parking is in high demand, the only thing that studies show works far worse than paid parking is free parking … read up on it. Google “Donald Shoup” and/or “The High Price of Free Parking”. Parking is indeed a tricky subject. Witness the numerous books and scholarly papers written about it, and the number of people who study it full time (Donald Shoup being one of the most well-known). Personally I find the subject fascinating: since starting this blog I’ve read a fair amount on the subject. I find the radically differing approaches taken by San Carlos (free parking everywhere) and Redwood City (paid parking downtown, free parking pretty much everywhere else) very interesting. People complain about each, but they both seem to have pluses and minuses. I haven’t reached any solid conclusions yet about which makes the most sense. Not that we need another coffee shop but some of the trendier SF/Oakland based coffee roasters have very small outposts. I’m thinking something along the lines of the Blue Bottle location in Hayes Valley or the Ritual Roasters in the Flora Grubb nursery or their shipping container location also in Hayes Valley. Going with the trendy crowd again some of the better known bakeries could probably have a small outpost assuming they have somewhat nearby production facilities…something like Manresa Bread, Josey Baker Bread, Tartine Bakery (unlikely)…maybe Cocola which isn’t as trendy but has a large facility nearby. I don’t know where the production facilities are for the others listed…probably Los Gatos and SF. I went with trendy since they’ll likely be able to pull from the tech crowd and can charge the prices to support what I’m going to assume is high rent. Not sure if this section is quite ready to support such businesses…Wienerschnitzel’s have pretty small footprints…just kidding!